Canterbury Manor is an assisted living facility in Edmonton that offers many activities for residents. These activities allow residents to maintain healthy lifestyles by encouraging movement and socializing with their peers. At Canterbury, being able to chat with other residents becomes an important part of many peoples' lives and Canterbury Manor offers common spaces that permit interaction with the larger community. 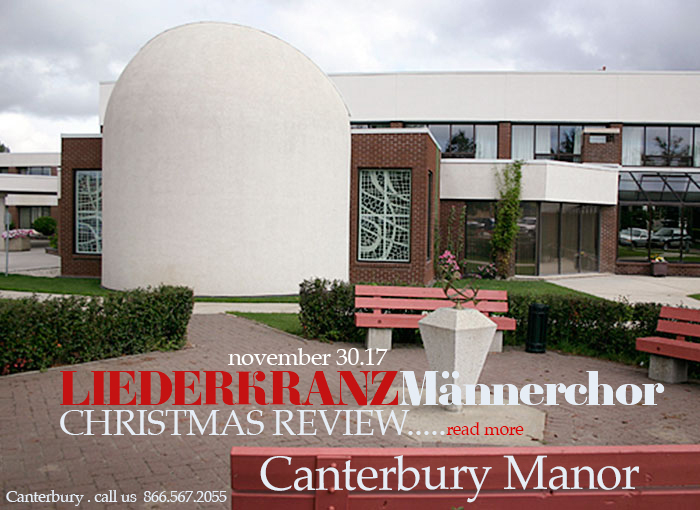 The central two-storey atrium of Canterbury Manor where Liederkranz German Men’s Choir performed a Christmas Review in German & English. A majority of the residents enjoyed as garnered by smiles. Wünscht allen frohe Weihnachten & ein gesundes neues Jahr ! Wishing everyone Merry Christmas & a healthy New Year !